Margaret hates camping. She would much rather be in her comfortable home, sitting in front of the T.V. and eating junk food. Instead, here she is in the wilderness with nothing to do. Now, to make matters worse, Margaret's mother is taking a rest and she expects Margaret to take care of Artie, her little brother. Margaret decides to take a walk and of course she has to take Artie with her. All goes well for a while until the children come across a bear. Terrified, Margaret grabs her little brother and she runs. She runs and runs until, she hopes, the bear is far away. Unfortunately, she has run so far that she has no idea where they are. After walking and searching for what feels like a long time, Margaret and Artie take shelter in a cave. She does not know what she is going to do. She has her little asthmatic brother to take care of and he does not have his asthma medicine with him. Then help arrives from a very unexpected source. Christopher, one of the rats living in a large nest nearby, sees Margaret and her brother and he understands at once that the children are in trouble. Christopher is one of the rats of Nimh, very intelligent animals who can, among other things, talk, read, and write. Christopher is determined to help the children, especially Artie with whom he quickly forms an attachment. Artie cannot (or will not) speak, but that does not stop the young rat and the little boy from becoming great friends. After an agreement is made between Margaret and the rats, the rats take on the responsibility of taking care of the children. Not only that, but they teach Margaret all kinds of things, and the ten-year old girl discovers that life can indeed be wonderful. 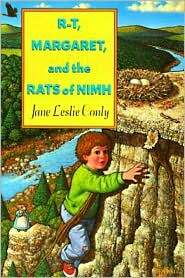 This is the third and last book in the Rats of Nimh trilogy, and in it the rats of Nimh have a new and special experience - they make friends with a pair of human children. Readers will be greatly entertained by the relationship that develops between the rats and the children, and it is interesting to see how angry, discontented Margaret changes as she discovers a new way of life, away from her precious T.V. and snack foods. Being around the gentle, kind, and hardworking rats in the beautiful wilderness has a profound effect on the ten-year old girl who once thought that camping was a form of punishment.